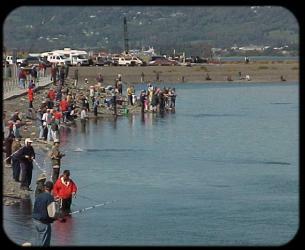 Alaska Fishing - Homer Spit Lagoon - Fishing Hole - Salmon fishing on the Homer Spit! - Regulations for most of these fisheries are very complex, be sure to visit the ADF&G's regulations section for more information! What do you get when you dig a large man-made pool on the end of Alaska's Homer Spit, and then plant it with a decent run of Alaskan king salmon in addition to silver and pink salmon??? In no sense of the word, a true Alaska wilderness experience; the 'Spit Lagoon', or 'Fishing Hole' is one of the most unique recreational salmon fisheries available to anglers anywhere! A 'terminal fishery' in the truest sense, the returning salmon have no place to spawn - good news for anglers, bad news for the fish - nearly all the returning fish are available for sport harvest, only a small fraction is needed for an egg take to continue the stocking program run by the Alaska Department of Fish & Game. Most years, anywhere from 3,000 - 6,000 kings are caught in this fishery. Similar to the run timing on other Peninsula king salmon fisheries, the run gets going in the latter half of May and peaks in mid-June with kings available through July. The pink salmon fishery is primarily a July and early August show. Primarily weighing in from 3-5 pounds, the pinks are far and away the easiest of the salmon to catch, making them a favorite of young anglers. As the pinks' numbers begin to dwindle, the Coho show up in force and provide anglers with a whole new round of fishing for silver salmon that average about 7-10 pounds through the month of August into early September. Spoons, spinners, and eggs fished solo or under a bobber are all popular offerings to all of the returning salmon. A secret tip from us: take a standard size hoochie (plastic squid), in either purple or green/white, and attach to a 3/8 jig head ... then cast this out and walk along the bottom ... deadly! Even if you choose to not participate in the fishery, it's a good show to watch and a nice way to spend an afternoon enjoying lunch and one of the most entertaining Alaska fishing spectacles you can find!